Somehow, some of the text fields in my spreadsheet contain tabs. I need to remove them so that I can import the file into another application. I can't figure out how to use them in a "Find" box. Nor display them so that I can delete them manually. 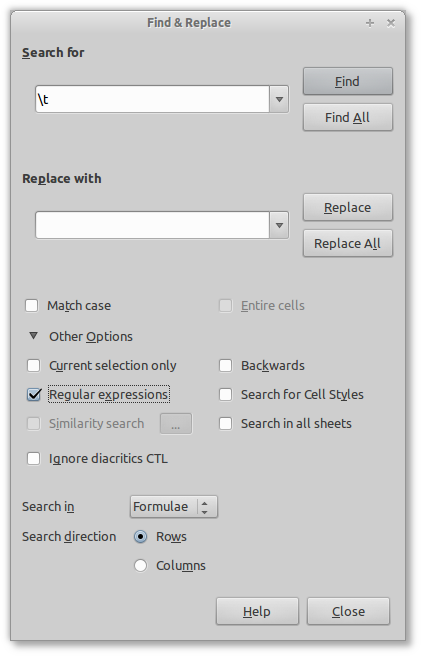 Do CTRL-H to bring up find/replace dialog. Make sure "Other Options" toggle has revealed the other options. In "Search for" field, put in: \t (that's the regular expression for tab character). and/or put your "Replace with" string in, and hit "Replace All".